Sorry, Bambi!. "Sorry, Bambi!" 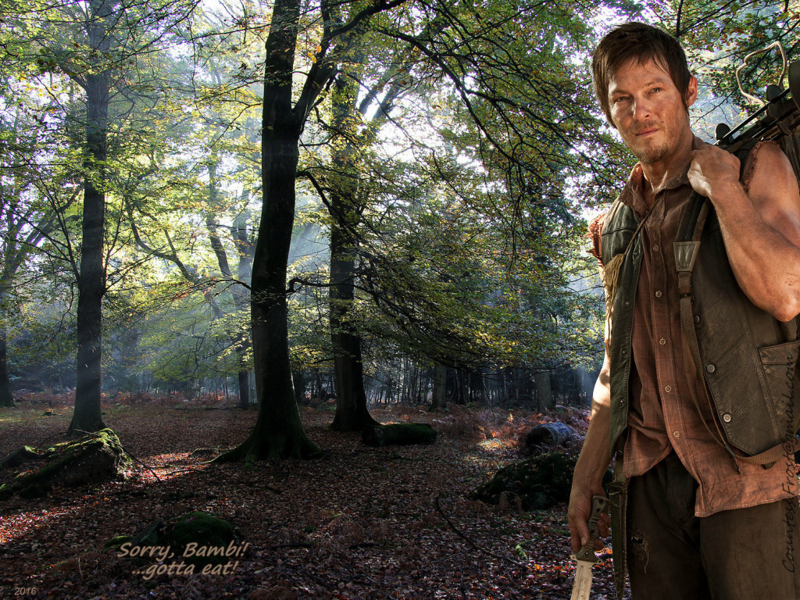 wallpaper created por TheCountess features Norman Reedus as Daryl from the TV series 'The Walking Dead'. 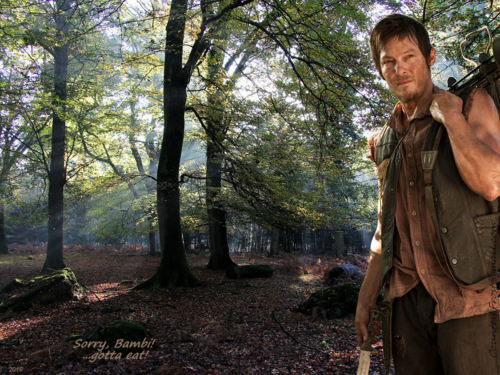 Note: no deer were hurt during the creation of this wallpaper.. HD Wallpaper and background images in the Os Mortos-Vivos club tagged: the walking dead twd tv series daryl dixon norman reedus crossbow hunting knife fan art wallpaper thecountess. This Os Mortos-Vivos wallpaper contains carvalho vivo, live oak, faia, árvore, mogno, árvore de mogno, and árvore. There might also be sitka, sitchensis picea, abeto, picea, sitchensis, sitka spruce, picea sitchensis, boina verde, forças especiais, soldado de elite, soldado de elite de boina verde, forças especiais, vidoeiro branco americano, vidoeiro de papel, vidoeiro paperbark, canoa de bétula, betula cordifolia, papyrifera betula, vidoeiro do paperbark, vidoeiro da canoa, betula papyrifera, american vidoeiro branco, paperbark vidoeiro, and vidoeiro de canoa.